Like everyone else, we are excited about the upcoming Microsoft ASP.Net Core 3.0 framework. We are particularly eager to try Blazor /Razor Components, which have the potential to turn web development more towards strongly-typed C# and WebAssembly. Syncfusion is thrilled to announce that a preview release of UI controls for ASP.NET Core Blazor /Razor Components is now available. 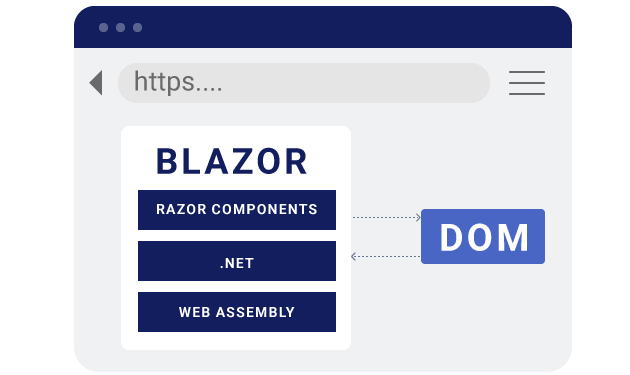 In this post, we will provide a brief introduction to Blazor /Razor Components. Blazor runs .NET code in the browser with WebAssembly. The Blazor application compiles the C# codes and Razor files into a .NET assembly. The client-side web browser downloads the assembly files. The WebAssembly will load the downloaded assembly files in the client-side. Blazor handles the DOM manipulation and triggers the browser API. Blazor is the experimental client-side hosting model for Razor Components. Razor Components is a new web framework to build interactive web UI with .NET. It is designed to run client-side in the web browser on a Blazor application. 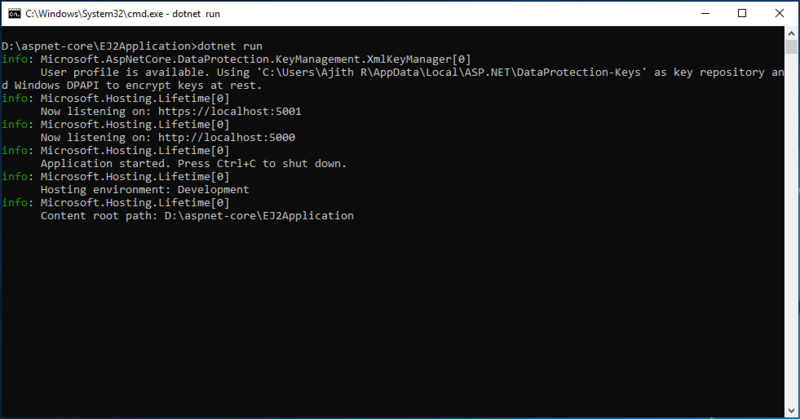 Now, .NET Core 3.0 provides support for hosting Razor Components from server-side by using an ASP.NET Core app. The SignalR connection handles UI updates from server to client and client to server. 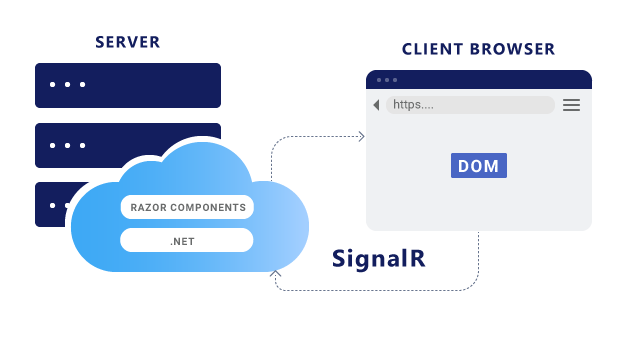 Razor Components runs .NET code on the server and interacts with the DOM in the client over a SignalR connection. Install the required software, .NET Core SDK 3.0 Preview, to start the implementation. Create a new Razor Components application by running the following command line from command prompt. This creates a new ASP.NET Core Razor Components application in the EJ2Application folder. Navigate to the application from the command prompt and open the application in Visual Studio Code or any code editor. Now, add the Syncfusion.EJ2.AspNet.Core.RazorComponents NuGet package to the new application and use the following command line to restore the packages. Open the ~/Components/_ViewImports.cshtml file and import the Syncfusion.EJ2.RazorComponents at the end. Add the required client-side resources as CDN references in the <head> element of the ~/Pages/index.cshtml file. Create a folder named Grid inside ~/Components/Pages/ and add the Default.razor file for rendering the DataGrid component. The Razor Components application itself has the WeatherForecastService for data binding. It can be validated in the link <localhost>/fetchdata once the application is run in the web browser. We are using the same service to bind the data to the Syncfusion DataGrid component. Now, use the following command line to run the application and it will run in a specific <localhost> port. For example: http://localhost:5000. Finally, navigate to the link <localhost>/Grid/Default and the final output of the Synfusion DataGrid in Razor Components will look like the following. This application is available in the GitHub repository for reference. In this blog, we have learned about Blazor /Razor Components, and rendering a Syncfusion UI control in ASP.NET Core Razor Components. Blazor is still an experimental project. So it is not yet ready for production. We are eagerly waiting to integrate the complete support of Blazor / Razor Components in the Syncfusion UI controls. Currently, we have provided most of the basic supports in our components. 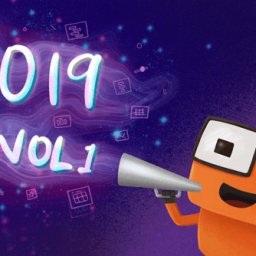 We will implement more features in our upcoming Volume 2, 2019, release. Feel free to download and test our preview version of Razor Components (demos, documentation, GitHub) and share your feedback in the support incident page or feedback page. How does the JS for the components run on the server when running in Server-Side Blazor mode?